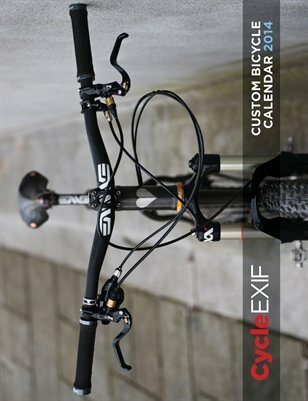 This is the third issue of the Cycle EXIF Custom Bicycle Calendar, and it's the best yet. The 2014 Calendar features thirteen of the world's best custom builders, both old and new. Enjoy the best of Cycle EXIF each month: From road racers by Giovanni Pelizzoli, Cherubim and Baum Cycles to cyclocrossers by Zukas Cycles and mountain bikes by Retrotec and Fast Boy Cycles. They've been captured by some of the world's best bicycle photographers like Brian Vernor, John 'Prolly' Watson and Andy Rogers. The layout is clear and understated, with multilingual day and months in English, French, Italian, German and Japanese.